Discussion in 'Multihulls' started by Doug Lord, Jul 13, 2012. The FP and the F20 are boats for expert sailors. I have received some pm from a builder asking why I'm remarking this. After my rides & reports, now on the 2 boats I can confirm that any talented kid currently racing H16 or F16 with an acceptable level can handle both boats in 8knots and flat conditions, on a controlled scenario. As proven by the RBSC kids at Carnac. And contrary some comments above you don´t need to be Outteridge to sail the FP at ease and almost do nothing for the boat to continue foiling stable, in that same wind range, any grownup catsailor with some racing hours behind can also helm or crew in that range without a problem and super stable. But beyond that wind speed these are dangerous boats to sail. Last Friday I helmed the F20 in 10 knots perfect flat conditions, and it was scary how high the boat flies upwind, I sailed with the owner who has some hours and plenty of F18 experience and it was a perfect ride for me as a crew & helm, mainly cause I was sailing with him. Needless to say, I avoided till that day to sail the 20, until I tested it with the right guy. sailed with Fer also, but in 5-6knots. Two rookies young or old can have some bad moments within 8-10knots either. As reported also we already had some rather serious incidents with a learning owner helming and his crew flying hard like the BAR & FP RB videos. the 20 needs a little more active trim. That is simply a fact anyone sailing both boats can confirm. All comments above in ideal perfect conditions. Above that grab your helmet & impact vest, and better sail with a guy you trust on his sailing skills or has some hours on any of them. We will be doing more local FP & F20 tests this coming week. Let me clarify few things that are not right, Artemis, Oracle and Red Bull were the very first one to order some FP. None of these teams were put ahead other customers. We are delivering the boats according to the chronological order. It is true that we have been late with deliveries due to lack of capacity of our yard, our first priority is quality, the production is running smoothly and slowly ramping up. I thank our valued customers for being so patient. This video is from www.catsailingnews.com and shows the Phantom slightly faster and pointing higher. Seems like the Phantom was foiling some of the time upwind. Go to the site to read more about it. As each year on the first weekend in May, Carnac Yacht Club will be organizing the Eurocat, one of Europe’s biggest gatherings of racing catamarans. This year, it will also be the first event for the Flying Phantom catamarans: The Flying Phantom Series – Eurocat 2015. Fifteen Flying Phantoms will be taking part in this big event on their very own race course off the main beach and the Yacht Club in Carnac – France. Darn it Doug! I just got on specifically to post that! You beat me to it! Man, incredible boats! I love them! Day 3 is up! Day 2 was canceled due to weather. Some pretty incredible footage from day 3! 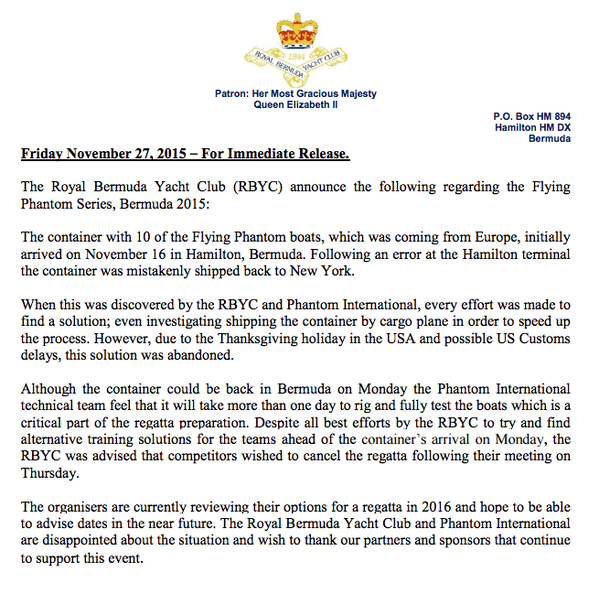 Flying Phantoms in Bermuda --cancelled! Flying Phantom? Will that be suitable for our flying King, Willem Alexander van Oranje. I spoke him 3 days ago and I think I am in his thinktank. People are how you treat them and thats only half true. Flying - What does it really take? A-Class Cats about to ban fully flying foils?